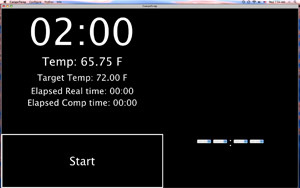 Workshop alum and Stanford scientist, Curt Palm, has created a new darkroom timer that significantly “one-ups” the popular Zone VI Compensating Developing Timer. CompnTemp ® is software rather than hardware and is available for both Windows and Mac computers. I set up a small shelf in my darkroom for my Mac Powerbook and all I have to do to get going is plug in the accessory USB temperature probe and cover the screen with red plastic. What sets CompnTemp apart from ANY other timer is that is completely user-programmable. if you want your target temperature to be 73 degrees instead of 68 that’s fine. If you want it to count UP instead of DOWN, that’s fine, too. You can save profiles so you can toggle from one group of settings for prints to another set of preferences for film. It even lets you customize the compensation curves. It also gives you a continuous read-out of the ACTUAL temperature.